Note: This workshop is free and limited to 10 students. There is a $25 materials fee to be paid on the first day of class. 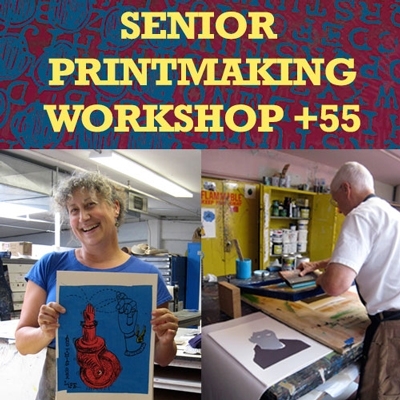 A new 10-week printmaking workshop for seniors age 55-plus kicks off on Oct. 3 and runs through Dec. 10, Wednesdays 1 to 4pm (no class on Thanksgiving week. This workshop will be all about serigraphy or screen printing on paper and textiles. Learn to print and meet new friends in a relaxed and supportive atmosphere. Students are encouraged to attend regularly as each session will build on the last. This workshop is free and limited to 10 students. There is a $35 materials fee to be paid on the first day of class. Mission Grafica Printmaking Studio is on the 4th floor and is wheelchair accessible. Teacher Bio: Marsha Shaw lives and works in San Francisco, California where she maintains an active art and teaching practice. She received an MFA in Printmaking from California College of the Arts in San Francisco and a B.A. and M.A. from California State University Northridge. Shaw is currently an adjunct faculty member at De Anza College in Cupertino where she teaches drawing and design. She is the manager of Mission Grafica, a print studio at Mission Cultural Center for Latino Arts, where she teaches printmaking workshops. She has lectured and taught courses in bookmaking and printmaking at California College of the Arts, San Francisco Center for the Book, Richmond Art Center, Museum of Children Art and Mendocino Art Center. Shaw’s work is in several collections and has been exhibited both nationally and internationally.